Marketing automation (MA) is one of the most commonly used marketing technologies. It has the potential to boost team productivity, improve customer retention, and increase revenue. However, as brightly as marketing automation shines in terms of eliminating repetitive processes, automating workflows, and skirting human error, it can only go as far as the data that’s fueling it. In the past 10 years, marketing has changed dramatically and the amount of customer data that’s generated has increased exponentially. 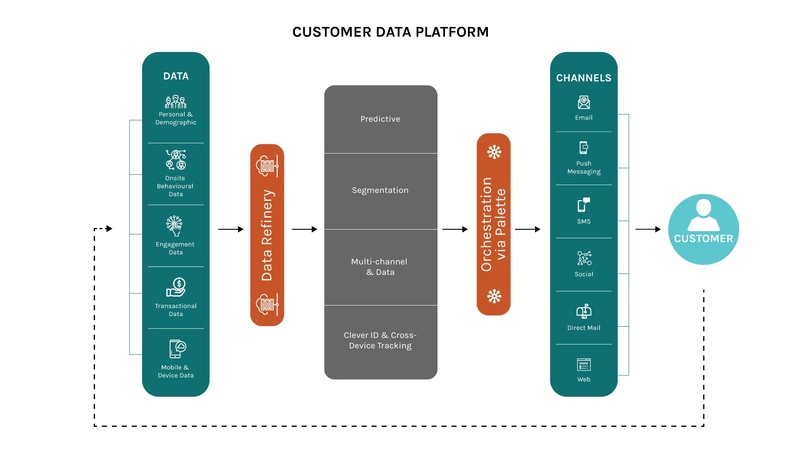 The challenge is that legacy marketing automation platforms have not been able to pivot and create streamlined solutions to solve the customer data problem. In fact, many of MA’s purported powers relative to predicting customer needs and decisions hinges on this often-overlooked factor: marketing’s access to customer data. A CDP is a relatively new technology that collects the customer data that’s most relevant to marketers across data sources. This could include sales data, website and PURL visits, mobile app sessions, email responses, social media comments, advertising performance data and more. Because of this, CDPs have the capability to collect, analyze and leverage a wider swath of customer information than MA alone, while not overwhelming marketers with irrelevant data such as order SKUs or credit card information. Further, CDPs are managed by marketers who often do not possess a technical or IT background (as opposed to CRMs, which are typically operated by IT teams). This means the time from data analysis to campaign execution is drastically reduced. A CDP also helps marketers to make smarter, more economical decisions as it relates to offline channels. Direct mail can be highly effective but is also expensive, so it’s typically used sparingly. With a CDP, direct mail pieces can be tailored and sent to the customers who are most likely to act upon the stimulus. With a CDP, a consumer could click on an email, receive an ad on Facebook the next day, and receive a catalogue or offer in the mail within a matter of days. This type of consistent, cross-channel experience is critical to building a more holistic marketing approach. If we think of a CDP as the base of a modern marketing stack, collecting data for the marketer to then feed into various channels, marketing automation is what sits on top. Without a CDP in place, marketing automation remains held back by siloed data and a general inability to be consistent across channels. Watch Laura Tentas, a senior solutions engineer at QuickPivot, talk more about how marketing automation platforms and customer data platforms work together. To dive deeper into how Customer Data Platforms and Marketing Automation compare, download our whitepaper on this topic.